Park opens daily at 7 a.m. November 1-March 31 and 6 a.m. April 1-October 31. Calling all photographers! Don’t miss your opportunity to enter our 2020 exhibition! Photographers may enter in one of three divisions: Youth, Amateur, and Professional. Entrants may submit a maximum of two photographs per season, one for each category, for a maximum of eight total entries for the year. Please note that the exhibit will be held in the Environmental Center. Monmouth County. 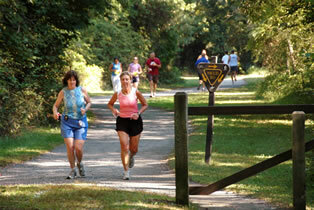 Now the most visited site in the Monmouth County Park System, over one million visitors come to the Manasquan Reservoir each year. The Manasquan Reservoir is a source of water for municipalities and utilities. The Reservoir is also a natural setting for recreational activities and outdoor pursuits. The 770-acre Reservoir is part of a larger 1,208 acre site that include woods and wetlands, a 5-mile perimeter trail, fishing and boating areas, and a Visitor Center. A bicycle repair station with a tire pump and tools has recently been added by the main trailhead kiosk near the Visitor Center. The site also features an Environmental Center, dedicated to providing experiences of learning and discovery related to wetlands ecology and wildlife and habitat protection through interactive exhibits, multi-media presentations, educational activities for schools and community groups, and wildlife observation areas. PLEASE NOTE: Large group (over 50 people) gatherings are not available at this site. Please see Picnic Areas for nearby county Park System facilities where large groups can be accommodated. Swimming is not permitted. The reservoir is an important part of the water supply in Monmouth County. Water from the Manasquan River enters and exits the reservoir through the inlet/outlet tower in the front of the main dam. With a 4 billion gallon water capacity and a maximum depth of 40', the reservoir can supply up to 30 million gallons of water a day. On June 7, the New Jersey Water Supply Authority will initiate a 4-acre pilot hydrilla management program off the Manasquan Reservoir boat launch by applying a pelletized herbicide application. Hydrilla is an invasive aquatic plant that degrades the natural habitat quality of the Reservoir. The herbicide selected, Sonar H4C, is a slow-release pelletized formula that contains the active ingredient fluridone. The application will be the first of up to five treatments that are scheduled to take place over the summer and early fall. For additional information, visit the Authority’s website www.njwsa.org/hydrilla which contains information about the pilot program, Hydrilla specific FAQs, and up-to-date details about the project. More in depth questions may be directed to Kenneth H. Klipstein or Heather Desko at the Watershed Protection Office 908-730-0270. This Center is the site of all boating activities at the reservoir and features a boat rental area, bait shop, vending machines, restrooms, fireplace and program activity rooms. The bait shop is closed December thru February. The second level observation deck offer spectacular views of the site. The Reservoir is open year round for fishing and is stocked with large and small-mouth bass, hybrid striped bass, tiger muskie, bullhead catfish and panfish species. A State fishing licenses is required for anglers age 16 and over. A license can be purchased at any local fishing supply/bait shop or by visiting the NJ Division of Fish & Wildlife website. 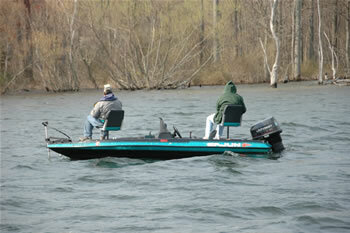 Fishing licenses are NOT available for purchase at the Manasquan Reservoir. 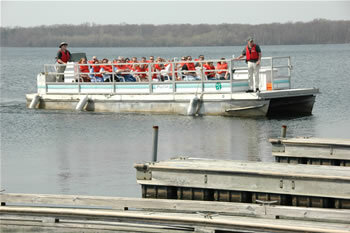 The boat ramp is open for the season March 1 through November 30. Seasonal and daily boat launch passes are available at the cost of $7 daily or $50 seasonal. All vessels must be launched from the east ramp at the Visitor Center. Boating is a great way to explore this site, take advantage of the fishing opportunities, or simply relax. All boats (with electric motors), sailboats, kayaks and canoes must be at least 8' in length, are permitted on the Reservoir. All persons boating on the Manasquan Reservoir shall wear a U.S. Coast Guard approved type I, II, III hybrid inflatable, or V personal flotation device in serviceable conditions. 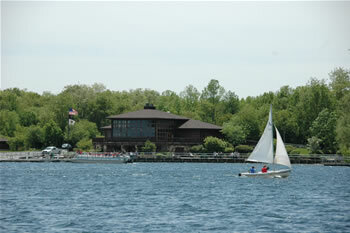 New Jersey State Boating laws and Park System rules and regulations are in effect on the water. 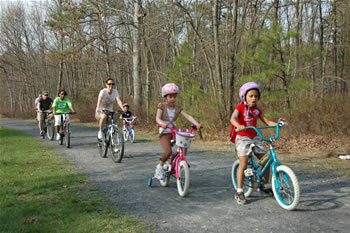 See our rules and regulations for the Manasquan Reservoir. Please note that the operation of an electric motorboat requires a NJ boating safety certificate. Rentals available starting at 9:30 a.m. Last rental at 6 p.m. All bicycles must be returned by 7 p.m.
Helmet rentals are included all bicycle rentals. Helmets must be worn at all times when riding a rental bicycle. This applies to adults and children. Rentals offered weather permitting. Call 732-783-4222 to verify before heading out. These 45-minute tours of the Manasquan Reservoir, Howell, are narrated by Park System Naturalists and include opportunities to view local wildlife including turtles, egrets, herons, ospreys and perhaps a bald eagle. Life-jackets are required. The cost is $6 per adult and $4 per child, 12 and under. Please call 732-751-9453 to confirm schedule as tours are both weather and water level dependent. All tours leave from the Visitor Center. 2 p.m, 3 p.m., 4 p.m. & 5 p.m.
2 p.m., 3 p.m. & 4 p.m. The 5.1 mile gravel Perimeter Trail offers panoramic views of the Reservoir and provides a great trail experience for all users. This trail loops all the way around the reservoir and has a fairly even, well-maintained surface and is designated as a MODERATE trail due to its length. Mileposts are marked on the trail. A bicycle repair station with a tire pump and tools has recently been added by the main trailhead kiosk near the Visitor Center. An additional 1.1 mile Cove Trail is a scenic nature trail which explores the lakeshore around the Environmental Center and is open to pedestrains only. Garden State Parkway to Exit 98, Interstate 195 west. Proceed on I-195 west to Exit 28B, Rt. 9 north-Freehold. Stay in right lane when entering Rt. 9 north. At first traffic light, turn right onto Georgia Tavern Road. Follow Georgia Tavern Road for 0.3 mile. Continue straight for Environmental Center on right or turn right onto Windeler Rd. and continue 1.5 miles to the Visitor Center Reservoir Area on left. State Hwy. 9 south from Freehold to Georgia Tavern Rd. Use Jughandle to turn left onto Georgia Tavern Rd. Proceed as above.